Martian Manhunter and Aquaman discuss Bruce's theory about a "puppet master" giving both Del Canto and Santa Bertriza the technology to develop metahuman warriors. Aquaman used his contacts among the crowned heads to narrow the list of suspects to the Netherlands. J'onn believes that is a little too obvious but Arthur remains convinced. In both Del Canto and Santa Bertriza the heads of state suspect sabotage from the other as their metahuman soldiers begin to sicken. Both sides come to the conclusion that they should deploy their remaining forces along with the captured Wonder Woman and Kyle Rayner who are still undercover. As the delegates of the Untied Nations continue to debate the United State's involvement (or lack of it) in the war between Del Canto and Santa Bertriza the two armies meet at the Miracle Belt and begin fighting. Wonder Woman and Kyle communicate telepathically and agree that they should try to keep the bloodshed to a minimum. Meanwhile Superman and Batman break into the research facilities in Santa Bertriza and Del Canto respectively as the League convenes telepathically to share what they've learned. Aquaman had a sit down with Queen Sylvia of the Netherlands which led him to Cristoffels Industries, Ltd. Batman knows Schuyler Cristoffels believes that given his heavy investments into quantum mechanics Cristoffels would love to get his hands on the mystery metal that he and Superman discovered in La Cintura. Superman puts everything together and realizes that Cristoffels is empowering both sides of the dispute and is using the conflict as a petri dish to work out the problems with the process so that no matter who wins he gets to grab the mystery metal. The League mobilizes to locate Cristoffels and help to keep things from getting out of hand when the people of both Del Canto and Santa Bertriza realize what has been done to them. Meanwhile Cristoffels has organized his own metahuman army to invade the two countries under the auspices of bringing peace to the region. He holds two of his soldiers back and instructs them while the rest of his army does their job they are going to get their hands on what he calls Cristoffelite and bring it to him. They inquire as to what they should do if they have problems. Cristoffels replies that any problems will be solved by his "special project" and God help anyone who get in its way. Story - 4: This is the second Justice League related book I've read this week where the writer pulled everything together and made it well worth the wait. This issue opened strong with an article by Clark Kent. This was a neat way for Howard Chaykin to get the expository stuff out of the way before delving right back into the story. With a story arc this long a little catching up is nice and it's even better if it flows smoothly into the action. Afterwards the pacing matched the past few chapters but it still worked out nicely because Chaykin gave us an all encompassing view of the events while showing how similar the two sides in the conflict are. I know that I keep harping on this but again what I liked the most is watching the characters interact. The scene between Bruce and Clark at the beginning was probably my favorite. The good natured ribbing was funny and while they were digging at each other you could see the respect. Once again Chaykin gives us his insight into who these characters are and what makes them tick. He came back to this later in the issue as they were nattering at each other while breaking into the research facilities. And how about that President this month? Good lord, who knew the old guy had it in him? I especially liked the comment he made at the end that he was the good cop. I thought it was a nice touch. Cristoffels emerged as a rather amusing villain this time out. Chaykin has always been good at having his villains talk with a mix of menace and humor and Cristoffels was no different. The comments at how he thought he was sounding like a German was a bit tongue in cheek but effective nevertheless. Given how the rest of the story has gone Cristoffels and his Swiss Miss crew of metahumans fit in perfectly. I also enjoyed Chaykin how paced the scene that revealed Cristoffels' plot so that everyone had a place in putting all the pieces in place and played to the individual characters' strengths. Batman got to use his connections as Bruce Wayne to do his part. Aquaman used his role as a head of state for his part. J'onn got to play the heavy and Superman used his investigative skills (cause he's a reporter you know) to fill in the gaps. Chaykin didn't leave anyone out, which is hard with a cast this large. Usually Batman is put into the role of dark knight detective but here he was part of a team and it was the whole team that got the job done. I prefer that to Batman acting like the smartest guy in the room followed by a bunch of heroes running off to fight. Art - 4: I'm discovering that it's hard to keep coming up with new things to say about the art of a story that has six parts to it. I sometimes repeat myself and I really don't like doing that all that much. So instead of going over the same ground again and again I'll just tell you about the one bit of art I really enjoyed this month. The metahuman army that Cristoffels had assembled. That one girl with the pig tails smiling like it was prom night really freaked me out. I mean the whole group was kind of scary in that wholesome, white bread way but that one girl gave me the willies. The monster at the end of this comic? It did nothing for me. The smiling bunch of Aryans (especially that one girl)? Scary as hell. Cover Art - 4: I liked this cover. I really did. It made some promises it didn't deliver on but at the same time it was a neat piece of art. It got me thinking about last month's cover, though. Last month we were treated to an image of Wonder Woman and Green Lantern fighting. That event took place is this issue. I wonder why this month's cover was used this month when it would have made more sense for last month's cover and vice versa. 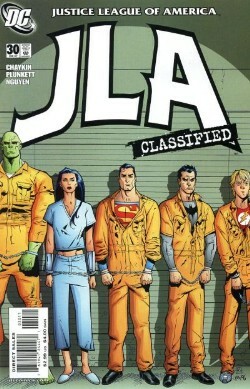 I mean several Justice Leaguers were taken captive last month, so seeing a the bulk of the team looking like they were going to break into a few bars of "Workin' on the Chain Gang" would have made more sense, just as seeing the two people who actually "fought" this issue fighting on the cover would have made sense this month. Then again maybe I'm over thinking this. Oh well. In any case I thought it was a nice cover.